Hello everyone! The following blog post was written by Ashley about her experience training for a guide dog at Guiding Eyes for the Blind, and how getting him changed her life. If you have any questions, feel free to comment or chat with Ashley on Twitter. You may contact her via our Twitter account: @BlinkieChicks, or via her personal account: @AshleyColeman51. 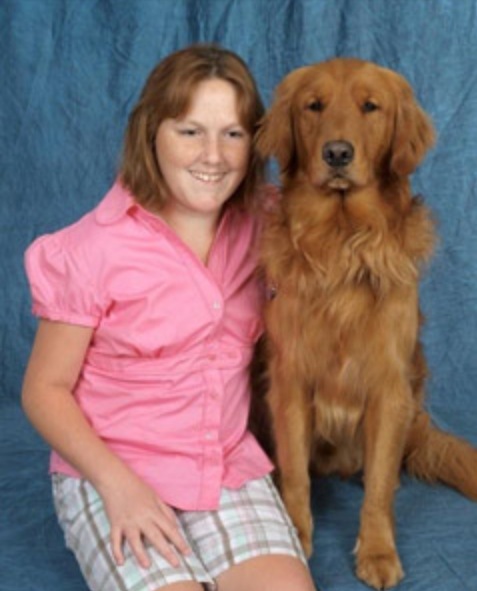 My name is Ashley Coleman, and I’d like to tell you about my experiences applying for, training with, and then working with my guide dog. I applied to Guiding Eyes in February of 2010, determined that they would have my paperwork as soon as I could possibly get it to them. In the middle of March, I completed all of my paperwork, and the admissions office had it in my file. I was contacted by a field rep, and we scheduled my home interview in early April. We met at my house on a day I did not have classes; I was asked many questions about my lifestyle, and about what I wanted to do in the future. After the field rep had asked me some of these questions, we went to my community college where I was videotaped walking a route through a normal day of classes for me. I was taken on a Juno walk where the field rep found out how fast I walked, what kind of pull I would like to have in a dog, and how I gave corrections. After the home interview, the field rep gave the admissions committee my information, which included the video of my walks. In late April/early May, I received a call from someone in admissions; she told me that I had been accepted. I called them several times between my home interview and finding out about being accepted. When I was asked to attend the June or July classes that summer, I was surprised. I decided to go to the June class, and I gave the person at admissions the information about my nearest airport. A few days later, I received my E-ticket, and started shopping for the things that I would need while at Guiding Eyes; one of the things on my list was a second pair of good walking shoes. (They were difficult for me to find). On June 7, 2010, I boarded my first plane. It took me to New York where I was met by Guiding Eyes staff. Several students were coming in at the same time I was, so I was able to talk to them on the car ride to Guiding Eyes. Once at Guiding Eyes, I was Oriented to the building and was left to unpack. Later that day, all of the students that were there–which were most of us–had a meeting with many of the Guiding Eyes staff, and we were warmly welcomed. After supper we had our first lecture with our trainers, and they introduced us to the equipment we would be using to train with our dogs. Harness, collars, and leashes were passed around for all of us to see, and we learned how they were to be used. We were allowed to keep our leashes; this made all of us very happy. On Tuesday, we went to White Planes to go on Juno walks with our trainers. They talk to us about what we looked for in a dog, and they also looked at how fast we gave corrections. They taught us how to give the dogs commands, verbal and leash corrections, and praise. Later on Tuesday night, we had a lecture on what was going to happen the next day. This happened every night, along with a lecture about how to care for our dogs. Some nights we would have lectures on how to groom our dogs, brush their teeth, leave them by themselves in case of an emergency, or you needed to go to a place that the dog did not need to go. After breakfast Wednesday morning, we had a little down time while the staff were in a meeting. When we were finished, we went to practice putting on and taking off the dogs equipment on a couple of stuffed dogs. We also practiced heeling Juno, and bringing Juno in and out of all kinds of doors. Those that hadn’t explored their outside door were shown that area because it is the relieving area,. After lunch, we were all brought into a meeting; several people spoke , and then our Class supervisor read the list of people matched with dogs. After this we went back to our rooms to wait for our dogs. At about 2:15, my trainer came in with my dog. I handed her my leash, and she clipped it to my dogs collar and left us alone until it was time to feed the dogs. Since it would be our first time feeding our dogs, the trainers came around to help us feed them. Once I received my dog, I felt like I had four extra left feet; however, I felt exhilarated, like I could take on the world. Later, we would heel our dogs to the cafeteria to have supper with our dogs by our sides for the first time. We also attended our first lecture with the dogs that night. On Thursday, we loaded up the vans and went to White Planes. We took our dogs for our first walks in harness. On my first walk with my dog in harness, I was intimidated in putting trust in my dog, but I did, and we had several awesome walks together. During the rest of the training, we went to different places like Malls, grocery stores, and such to experience working with our dogs in all kinds of settings. Near the end of training, the trainers took us to Manhattan for a half day to walk around the area, experience their public transportation, and to have lunch in one of the small restaurants there. Here I experienced riding on a train and a subway for the first time in my life. I was scared I would get lost in the big city, but I learned that my dog and I can handle anything that was thrown at us. On the last Saturday in class was Graduation. Most of the puppy raisers came, and there was a ceremony where the graduates spoke and sang, and the puppy raisers were given a picture of the new team and the person’s contact information. After the ceremony, the person, the dog, and the raiser had time to sit down and talk for a while. I was very excited to meet my boys puppy raiser. One of the things that I was afraid of was that she would not think that I handled my dog the way she would have expected or wanted. Class ended on the 2nd of July, and I took a plane home. Shortly after that, I returned to school for my last year of school. My pup and I walked across the stage at my community college in May, 2011. During this time, I was learning how to handle my dog without the trainers being around to help me. we both were continuing to learn how to trust and work with each other. I was worried that I would mess up my dog’s training or behavior in general, but we managed to keep it together, and to remain a solid team. We went on to spend a few months at the North Carolina Rehabilitation Center for the Blind, where I brushed up on some of my daily living skills before I moved to college. I was allowed to work with one of the Orientation and Mobility Instructors to work on some college campuses like the one I would be going to the following year. The instructor also taught me routes on the GMS campus where the Rehabilitation Center is located. We also traveled out in the city of Raleigh, where I finally got to use an audible signal. I have had a guide dog for three years now. since he’s pranced into my life, my dog has improved it so much. My dog has made me a more independent and safe traveler; I know that with him by my side, we can conquer anything. My dog is my eyes, and I depend on him to tell me what I can’t see. He leads me around obstacles and things in my path. When he sees traffic coming at us, he has been taught to disobey me. He gets me out of the way. He has been with me everywhere, from hotels, to restaurants, and to ball games all around my college campuses. He has remembered where my room is, and he has learned the way to all of my classes. He has become the light of my life; I am glad I went to get a guide dog. Tagged Blindness, college, guide dogs, Guiding Eyes, travel, visual impairment. Bookmark the permalink. What an amazing story. My family and I have raised 3 dogs for Guiding Eyes and one of them is helping a young woman just like you. We are excited to be getting another puppy this month. Congrats on being accepted and getting your first guide dog! My former roommate, who passed away in February of this year, was a guide dog user during the last few years of his life. He received his dog from The Guide Dog Foundation for the Blind, and she worked out great for him. I can still remember his sheer excitement at being accepted into the school, and also my excitement for him. In a rather odd turn of events, I was asked if I had ever thought about applying for and getting a guide dog. I say that because my independent outdoor travel skills are not at all where they should be. But I met with an intern who worked at our nonprofit organization for a little while, and he was the main driving force behind me applying at 2 of the guide dog schools. I wouldn’t’ve even applied if it weren’t for his coercive ways. He was a nice guy with good intentions, but I and some others here think he pushed just a bit too hard on that one. But anyway, the 2 schools currently have applications on hold for me and I’m rather unsure at this point what to do about it. If memory serves me, one of the schools said they’d hold my application for 5 years, and the other I think is holding my application for 2 or 3 years. I applied to the Guide Dog Foundation for the Blind since that was where my former roommate got his dog. The other school I chose was Leader Dogs, because I have an aunt and uncle who have been puppy raisers for the school for a long time.